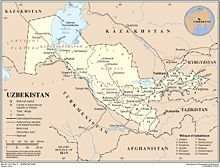 Uzbekistan, officially the Republic of Uzbekistan, is a doubly landlocked country in Central Asia, formerly part of the Soviet Union. It shares borders with Kazakhstan to the west and to the north, Kyrgyzstan and Tajikistan to the east, and Afghanistan and Turkmenistan to the south. 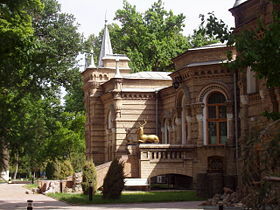 The territory of Uzbekistan was already populated in the second millennium BC. Early human tools and monuments have been found in the Ferghana, Tashkent, Bhukharra, Khorezm (Khwarezm, Chorasmia) and Samarkand regions. Alexander the Great conquered Sogdiana and Bactria in 327 BC, marrying Roxana, daughter of a local Bactrian chieftain. The conquest was supposedly of little help to Alexander as popular resistance was fierce, causing Alexander's army to be bogged down in the region. For many centuries the region of Uzbekistan was ruled by Iranian Empires, including the Parthian and Sassanid Empires. In the fourteenth century AC, Timur, known in the west as Tamerlane, overpowered the Mongols and built an empire. In his military campaigns, Tamerlane reached as far as the Middle East. He defeated Ottoman Sultan Bayezid I, who was captured, and died in captivity. Tamerlane sought to build a capital for his empire in Samarkand. Today Tamerlane is considered to be one of the greatest heroes in Uzbekistan. He plays a significant role in its national id and history. Following the fall of the Timurid Empire, Uzbek nomads conquered the region. In the nineteenth century, the Russian Empire began to expand, and spread into Central Asia. The "Great Game" period is generally regarded as running from approximately 1813 to the Anglo-Russian Convention of 1907. Following the Bolshevik Revolution of 1917 a second less intensive phase followed. At the start of the 19th century, there were some 2,000 miles (3,200 km) separating British India and the outlying regions of the Tsarist Russia. Much of the land in between was unmapped. By the beginning of the twentieth century, Central Asia was firmly in the hands of Russia and despite some early resistance to Bolsheviks, Uzbekistan and the rest of Central Asia became a part of the Soviet Union. On August 31, 1991, Uzbekistan declared independence, marking September 1 as a national holiday. The country is now is seeking to lessen gradually its dependence on agriculture - it is the world's second-largest exporter of cotton - while developing its mineral and petroleum reserves. Uzbekistan is approximately the size of Morocco and has an area of 447,400 square kilometres (172,700 sq mi). It is the 56th-largest country in the world. Uzbekistan stretches 1,425 kilometres (885 mi) from west to east and 930 kilometres (578 mi) from north to south. Bordering Turkmenistan to the southwest, Kazakhstan and the Aral Sea to the north, and Tajikistan and Kyrgyzstan to the south and east, Uzbekistan is not only one of the larger Central Asian states but also the only Central Asian state to border all the other four. Uzbekistan also shares a short border with Afghanistan to the south. Uzbekistan is a dry, landlocked country; it is one of two double-landlocked countries in the world - the other being Liechtenstein. 10% of its territory is intensely cultivated irrigated river valleys. The Climate in the Republic of Uzbekistan is continental, with little precipitation expected annually (100-200 millimetres, or 3.9-7.9 inches). The average summer temperature tends to be 40 C, while the average winter temperature is around 0 C.
Major cities include: Bhukharra, Samarqand and Tashkent. Along with many Commonwealth of Independent States economies, Uzbekistan's economy has recently shifted into high gear, recording 9.1% growth in the first quarter of 2007, along with a low inflation rate of 2.9%. However, Craig Murray, author of "Murder in Samarkand", suggests that official statistics about Uzbekistan are not trustworthy. Uzbekistan has a very low GNI per capita (US$460 giving a PPP equivalent of US$1860). Economic production is concentrated in commodities: Uzbekistan is now the world's fourth-largest producer and the world's second-largest exporter of cotton, as well as the seventh largest world producer of gold. It is also a regionally significant producer of natural gas, coal, copper, oil, silver, and uranium. Agriculture contributes about 37% of GDP while employing 44% of the labour force. Unemployment and underemployment are estimated to be at least 20%. Facing a multitude of economic challenges upon acquiring independence, the government adopted an evolutionary reform strategy, with an emphasis on state control, reduction of imports, and self-sufficiency in energy. Since 1994, the state controlled media has repeatedly proclaimed the success of this "Uzbekistan Economic Model" and suggested that it is a unique example of a smooth transition to the market economy while avoiding shock, pauperisation, and stagnation. The gradualist reform strategy has involved postponing significant macroeconomic and structural reforms. The state in the hands of the bureaucracy has remained a dominant influence in the economy. Corruption permeates the society: Uzbekistan's 2005 Index of perception of corruption is 137 out of 159 countries. Much of Uzbekistan's GDP growth comes from favourable prices for certain key exports, especially cotton, gold, corn, and increasingly gas, but the revenues from these commodities are distributed among a very small circle of the ruling elite, with little or no benefit for the populace at large. At cotton-harvest time, all students are mobilised as unpaid labour. Thus, the national bourgeoisie in general, and the middle class in particular, are marginalised economically, and, consequently, politically. The economic policies have repelled foreign investment, which is the lowest per capita in the CIS. For years, the largest barrier to foreign companies entering the Uzbekistani market has been the difficulty of converting currency. In 2003, the government accepted the obligations of Article VIII under the International Monetary Fund, providing for full currency convertibility. However, strict currency controls and the tightening of borders have lessened the effect of this measure. Uzbekistan's external position has been strong since 2003. Thanks in part to the recovery of world market prices of gold and cotton, the country's key export commodities, expanded natural gas and some manufacturing exports, and increasing labour migrant transfers the current account turned into a large surplus - of between 9 and 11 per cent of GDP in 2003-05 - and foreign exchange reserves, including gold, more than doubled to around US$3 billion. 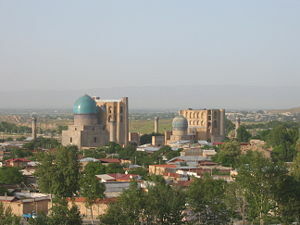 Uzbekistan is Central Asia's most populous country. Its 27.7 million people comprise nearly half the region's total population. The population of Uzbekistan is very young: 34.1% of its are people are younger than 14. According to official sources, Uzbeks comprise a majority (80%) of the total population. Other ethnic groups include Russians 5.5%, Tajiks 5%, Kazakhs 3%, Karakalpaks 2.5%, and Tatars 1.5%. There is some controversy about the percentage of the Tajik population. While official numbers from Uzbekistan put the number at 5%, some Western scholars believe it to be much higher, going as high as 40%. There is also an ethnic Korean population that was forcibly relocated to Uzbekistan by Stalin in the 1930s. There are also small groups of Armenians in Uzbekistan, mostly in Tashkent and Samarkand. The nation is 88% Muslim (mostly Sunni, with a 5% Shi'a minority), 9% Eastern Orthodox and 3% other faiths. The US State Department's International Religious Freedom Report 2004 reports that 0.2% of the population are Buddhist (these being ethnic Koreans). At least 10 percent of the Uzbekistan's labour force works abroad (mostly in Russia and Kazakhstan). Uzbekistan has a 99.3% literacy rate among adults older than 15, which is attributable to the free and universal education system of the Soviet Union. The Uzbek Language is the only official state language. Russian is still an important language for interethnic communication, including much day-to-day technical, scientific, governmental and business use. Tajiki is also used in some areas (Tajiks are found primarily in the cities of Samarkand and Bhukharra, with scattered populations elsewhere). Tashkent, the nation's capital and largest city, has a three-line subway built in 1977, and expanded in 2001 after ten years' independence from the Soviet Union. Uzbekistan is currently the only country in Central Asia with a subway system, and it is considered to be one of the cleanest systems in the world. There are government operated trams, buses and trolley buses running across the city. There are also many taxis, both registered and unregistered. Uzbekistan has car-producing plants which produce modern cars. The car production is supported by the government and the Korean auto company Daewoo. The Uzbek government acquired a 50% stake in Daewoo in 2005 for an undisclosed sum, and in May 2007 UzDaewooAuto, the car maker, signed a strategic agreement with General Motors-Daewoo Auto and Technology (GMDAT). The government also bought a stake in Turkey's Koc in SamKocAuto, a producer of small buses and lorries. Afterwards, it signed an agreement with Isuzu Motors of Japan to produce Isuzu buses and lorries. Train links connect many towns within Uzbekistan, as well as neighbouring ex-republics of the Soviet Union. Moreover, after independence two fast-running train systems were established. There is also a large airplane plant that was built during the Soviet era. Tashkent Chkalov Aviation Manufacturing Plant. The plant originated during World War II, when production facilities were evacuated south and east to avoid capture by advancing Nazi forces. Until the late 1980s, the plant was one of the leading airplane production centres in the USSR, but with collapse of the Soviet Union its manufacturing equipment became outdated, and most of the workers were laid off. Now it produces only a few planes a year, but with interest from Russian companies growing in it, there are rumours of production-enhancement plans. This page was retrieved and condensed from (http://en.wikipedia.org/wiki/Uzbekistan) see Wikipedia, the free encyclopedia, March 2008.